The first law of thermodynamics is a restatement of the conservation of energy. It says that the energy loss must equal the energy gain of a system. It relates the heat input and output, the work done on the system and the work the system does, and the change in internal energy, or temperature change. For example, the cylinder and moving piston of an automobile engine is heated by the burning of gasoline in the cylinder. The piston moves out, doing work, and heat is transferred to the coolant because of the higher temperature of the cylinder and piston. As long as the temperature of the cylinder and piston does not change, the heat input equals the work output plus the heat output. Energy isn’t gained or lost, it just changes form. 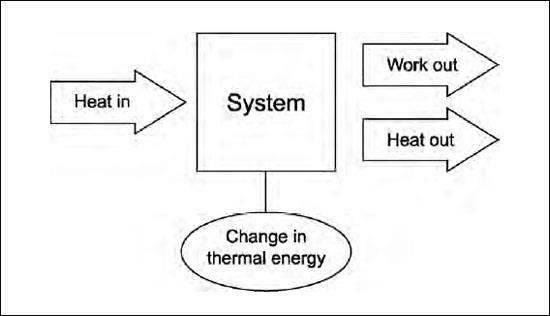 Another way to state the first law is that net heat input equals net work plus change in thermal energy. Note that heat can be either positive (heat input) or negative (heat output). Work can also be positive (work done by the system) or negative (work done on the system). Thermal energy can also go up or down.